Writers and researchers for top-rated CBS crime drama CSI: first contacted me and sought my input for plot ideas about six months prior to the series premier in 2000. Since then, I have developed many friendships related to the show and have continued a long-term consultant relationship. The writers bestowed on me a great honor when forensic artist character, Teri Miller, played by actress Pamela Gidley, was roughly based on me. Her character was originally developed as a “love interest” for Grissum (played by William Petersen) but alas, things just didn’t work out for them and they both moved on. The episode “Snuff” marked my first visit to the California set so that both my artwork and my hands could appear on camera. “Snuff” was co-written by Ann Donahue and Bob Harris and directed by Kenneth Fink. Certain scenes for this episode were shot at the old Ambassador Hotel, site of the assassination of Robert Kennedy in 1968. My role in this episode included several things. 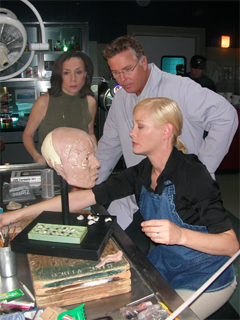 I consulted with writers about how to accurately incorporate forensic facial reconstruction into the plot, I created the step-by-step sculpted props, and I acted as an assistant to the actors on the set. 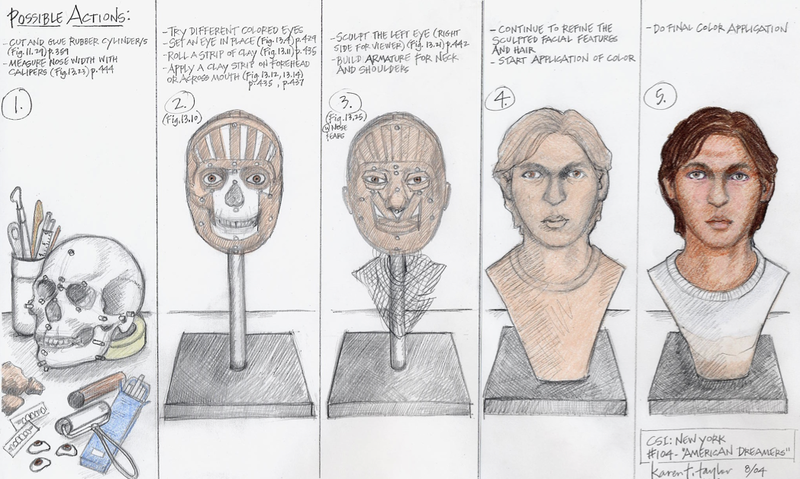 The first step was to do storyboard type drawings of the various stages for the facial reconstruction props. This would allow the writers and directors to plan the action prior to filming. Time is money and careful advance planning is critical. 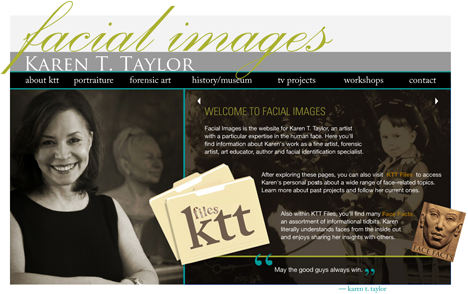 While still in Texas, I created three primary stages for the facial reconstruction. Sculpting in real time would be far too time-consuming during filming, so all of this advance preparation was necessary. As part of the plot, anthropologist “Teri Miller” determined that the skeletal victim had Downs Syndrome, so my reconstruction had to reflect that. Actor Blair Williamson and I had a lot of fun and he even tried his hand at modeling some clay. My time on the set in Los Angeles was great. One of my favorite things was interacting with young actor Blair Williamson who played my “victim” in the life sequences. Blair was so enthusiastic and really enjoyed seeing the sculpture I had made to resemble him. There’s a lot of “hurry up and wait” in television production. I feel like my time spent testifying in court has given me some good preparation for that. Sometimes on the set, I just sat around in the background and waited until the director yelled my name for assistance. At one point, Billy Petersen remarked to me, “Hey, you don’t seem to be bothered at all by the craziness on the set. Some of the other advisors have problems with it.” We then had a good chat about real autopsies, testifying against real rapists and murderers and trying to help real crime victims. I explained that stress for me was struggling to do a fast and accurate composite sketch when a child had been abducted and the news crews were outside my door…the potential for life or death. He totally got it and understood why I was unfazed, even a bit amused by the “Hollywood” variety of stress. I have gained a genuine respect for the pressure-filled schedules and demanding work that is necessary during the creation of television shows. I am awed by the amazing skill and craft of the actors and all of the various individuals involved in production of a show like CSI:. I am proud to have had the opportunity to be a part of it.